Create Abundance is a one of a kind villa at Tryall Club. It’s huge and well-suited for entertaining, the deck can hold 50 people! There’s a game room, playground, and basketball court to keep everyone entertained, and the Tryall Club has great amenities for villa guests. Tennis, golf, dining, and a full staff all at your disposal! 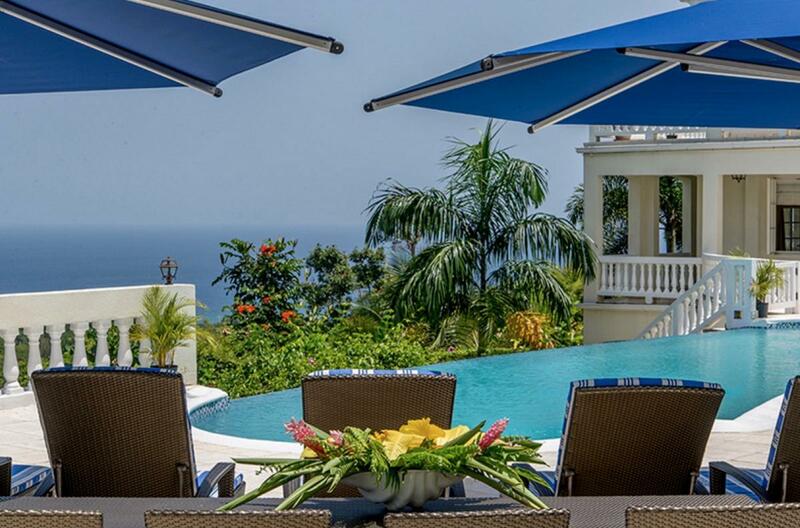 Create Abundance sits on a hill overlooking Montego Bay and Hanover, as one of the largest villas of Tryall Club. This villa also has panoramic views of the bay and ocean, with five master apartments, a children’s playground, basketball court, and a fully equipped office. The villa is split level, with a plunge pool and deck on the main level. The deck easily accommodates 50 people and has dining for up to twenty, with a special dining area for children. The formal dining room inside can seat 16 guests, and the sitting area adjacent to it has a 56” flat screen television. This villa is the only one in Tryall Club to have a full Kosher kitchen. There’s also a business office and a game room on this level. Each of the bedrooms offer air conditioning, ceiling fans, ensuite bath, and views. The main floor has two master suites, each with king-sized beds and private balconies with ocean views. Three of the five bedrooms on the lower floor have king-sized beds, and four have twin beds that can be converted to kings. A few of the bedrooms are designed for children, with kid-friendly decor and sleep sofas. Guests at the Tryall Club have access to complimentary tea at the Great House, the weekly Manager’s Cocktail Party, the Kid’s Club, tennis courts, and golf. Heated pool deepest point 5'7"